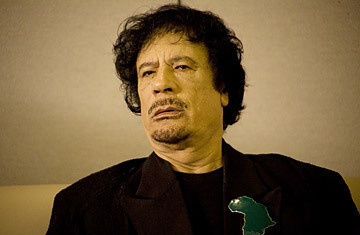 On Sept. 24, TIME editors Romesh Ratnesar and Michael Elliott met with Libyan leader Muammar Gaddafi. Given your experience in dealing what the United States offered in return for giving up your [nuclear] program, what advice would you give to a country like Iran? And what advice would you give to the United States in dealing with Iran's nuclear ambitions? America has the responsibility to reward and encourage such countries who take such decisions, so that they will be able to use nuclear energy or nuclear power in peaceful means. Upon the advice of our American friends, and others, when they told us to maybe get in touch with Pyongyang and Iran, and encourage them and talk to them so that they would not go to the use of nuclear energy for military purposes, divert the potentials of the capability they have for peaceful means, the actions or the answers from those such countries was, What did Libya gain in the trade? Are you saying that Iranians and North Koreans don't think that Libya got enough benefits for giving up its program? Indeed that's what they said to us. Indeed. Libya spoke to both the Iranians and the North Koreans on this topic? Yes, indeed. Of course, I mean we have conveyed to them the wish of the friends, that they got in touch with us, mainly in the interest, the wish that they would take the peaceful road. You're chairman of the African Union at the moment. You referred to President Obama in your speech yesterday as the "son of Africa." Do you feel a kinship with President Obama? And what would you like the United States to do in Africa? Indeed this kinship is there, is existing. Regarding the second part of the question, Africa, I mean there are good intentions, legitimately speaking, particularly with international governing toward Africa  some sort of sympathy. In the conflict between Israel and the Palestinian people you have advocated a one-state solution. Many people criticize that kind of idea as something that would lead to the end of Israel as a Jewish state, a homeland for the Jews. Do you believe that Israel has a right to exist as a Jewish state? The position that we are in, the road that the world is going on, would lead to the destruction of the Jews. Because generally speaking, Jews as a community are limited, their number is limited, all over the world. We know that they're not that big. Unfortunately, they were persecuted by all nations. They were persecuted by the Romans and King Edward I. And we all know the Holocaust during Hitler's time. Once seeing the history like that we can only but sympathize with them as Jews. The Arabs actually were the ones who gave them the safe haven and the protection along all these areas when they were persecuted. As recent as '48 or '49  I was a little boy at the time but I can still remember  the Jews were there in Libya. There was no animosity, no hatred between us. They were merchants, moving from one place to the other, traders ... and they were very much respected and very much sympathized with. I mean, they did their own prayers and we saw them. They spoke Arabic, wearing Libyan uniforms, Libyan clothes. So that's why I said, the way things are going, in the end they would  it will be the eradication of them, or the extinction of such a community. And I believe that the whole world is plotting against them, against the Jews. They want to get rid of them, the world wants to. And things that happened in the past indicate or give witness to this idea or this notion. It was the Holocaust in Europe. We all know that, this is a fact. The answer is as follows: That we have to serve God, or guarantee the safety of the Jews. And this can be done by them accepting the Palestinians, recognizing the Palestinians, accepting that fact that they should live with the Palestinians in one state, together. Unfortunately, the Jews are fighting or struggling against their own friend  the Arabs. The Arabs did not do the Holocaust, and the Arabs are not the Romans who persecuted them or massacred them. The only way open for them is to accept the Arabs and to accept to live with them, to co-exist with them. Because the establishment of a pure Hebrew state is not in their own interest. That would be a target. Their protection comes from being part of the Arab scene. Mixing with the Arabs. I believe that the youth supports me, supports my idea ... Investors would prefer this mixing with the Arabs, being with the Arabs, living with the Arabs, co-existing with the Arabs. But they have to accept refugees that were kicked out in 1948. This is a fundamental thing, a basic thing. Otherwise, war will continue, the struggle will continue. Some Americans still view you, and view Libya, with some suspicion, despite the normalization of relations. How can that impression be changed and do you think it ever will change? This is the result of accumulation of so many years of strained relations between our two peoples and our two countries. It was propaganda ... against us. It was very much exaggerated, this information campaign, this sustained campaign against us. But if I may ... Over the process of years it will thaw out. I mean, just gradually through contact, through dialogue, through investment. I know that the Lockerbie case has come to a legal end, but there are people in the United States who would still say, in 2003, Libya accepted responsibility for its officials but it would be wonderful if it was a heartfelt expression of remorse and an apology for what happened. That might help thaw the ice. It was always said that it is not us who did that and they don't accept the fact that they have a responsibility for the Lockerbie bombing. And all the nonaligned nations used to support the Libyan claim. But we go through the resolutions adopted by ... more than 150 countries, both of the resolutions of the Arab League, all of the resolutions adopted by the African Union, all of the organizations ... conflict resolutions. But of course, Americans, Libyans, the whole world express sympathy or regret over such tragedies. No one would be happy over such tragedies, no one would welcome such a tragedy, indeed, of course. Do the American people feel happy, are the American people happy over the killing of the Libyan citizens in 1986? And is the world happy about the Gaza massacre? By the same token none of us are happy over the tragedy of Lockerbie. Up to now, if you visit the house that was bombed in the American raid, you will find a picture of my daughter, a picture of the daughter of Jim Swire, in a frame there, and everybody goes there. Our children are all victims. I mean, these pictures, just to say the fact that we are all fathers of victims. Tell us about your impressions of America. We didn't see anything because of the security measures. Is there any place in America that you have always wanted to see?